Traffic jam in front of the Colorado Winton Motor Carriage Company and the Bicycle Supply Company. Three new automobiles at the corner of 18th and Stout Streets in downtown Denver. Businesses pictured include the Colorado Winton Motor Carriage Company and the Bicycle Supply Company. Some of the world's best known automobile brands began as bicycle companies, including Morris in England, Opel in Germany and Peugeot in France. The Dodge brothers built bicycles in Michigan. The Duryeas introduced the women's drop frame with their Sylph bicycles in Massachussets and almost certainly built the automobile that struck a woman cyclist in the first reported accident of its type in New York City on May 30, 1896. In Dayton, Ohio, inventors at the Wright Cycle Company built Van Cleve and St. Clair bicycles to customer specifications while they dreamed of flight. 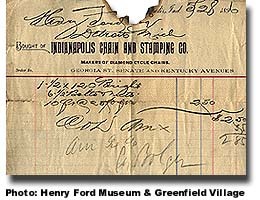 Henry Ford used a bicycle chain to connect a gasoline engine with the driving wheels on his Quadricycle. He hired the famous bicycle racer Barney Oldfield as a racing team driver. 1898 Portland's first automobile was a Locomobile which Henry Wemme had shipped west from Newton, Mass. Contemporary accounts report this first car frightened so many horses that there were numerous runaways. The German immigrant believed that operating his vehicle in Portland during that year caused more runaways than there had been in the preceeding 20 years. In 1900 he sold the machine to a Spokane, Wash. man. Wemme also owned Portland's second automobile, a Hayes-Apperson, which he purchased in Kokomo, Ind. He bought Portland's first Oldsmobile, first Reo and first Pierce Arrow and became president of the Portland Automobile Association. By 1905 there were 218 automobiles in Oregon, 40 of them in Portland. An Oldsmobile two-cylinder touring car sold for $1,550.00 and runabouts were priced at $750.00. The Winton Model C, a four-cylinder model, was priced at $1,800.00 from Portland's Ben Holladay Automobile Company at 495 Alder Street. The luxurious Pierce Arrow sold for $3,650.00. 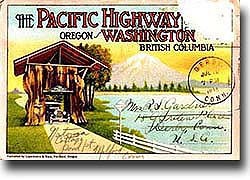 At the urging of the Portland Automobile Club, the Portland City Council raised the automobile speed limit from 8 to 10 miles per hour in fire limit areas and 15 m.p.h. elsewhere in the city on May 2, 1906. Bicycles shared downtown Denver's 16th Street with trolleys, automobiles and horse-drawn wagons in the early 1900s. 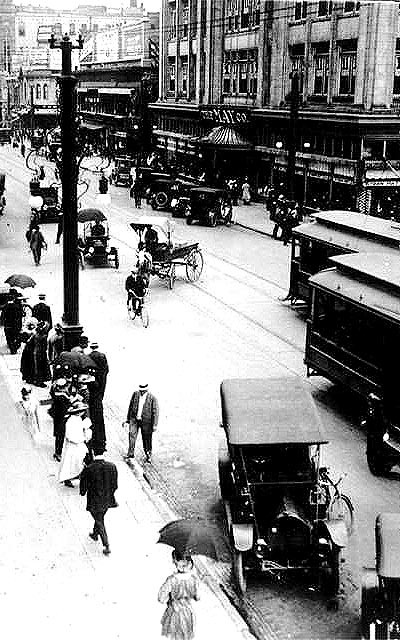 circa 1902 Crossing a street in downtown Denver or any city at the turn of the century could be an adventure. 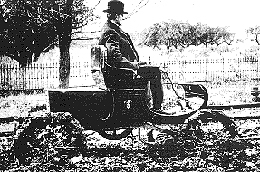 Horse-drawn wagons and trolleys competed with bicycles and the new automobiles. Pedestrians were reminded to watch their step -- downward -- as well as left and right before attempting any crossing. Horses pulled the first streetcars, but they were soon replaced by electric motors. 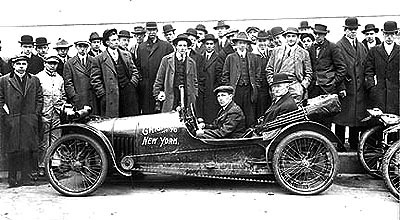 1913 Chicago to New York Auto Race. While information about this event is elusive, the back of the print includes some handwritten notes about the vehicle depicted. It is a 1913 Imp Cyclecar with two cylinders, 10 to 12 horsepower, and a maximum speed of 50 miles per hour. It sold new for $375. Cyclecars -- simple, economical vehicles that worked on the same principles as a bicycle -- were relatively new in 1913, and a New York-based cyclecar club was established in December of that year. 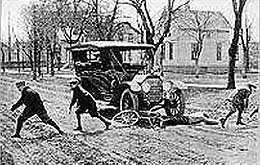 Broken chains led to catastrophic accidents and hastened the acceptance of Fords and other automobiles. G.H. Atkin, Certificate No. 140, May 14, 1900. Reports at the corner of Jackson and State Strets, riding east, a young man on bicycle attempting to get out of way of pedestrian, got in front of my vehicle. I rang my bell repeatedly, but he did not seem to notice me. My vehicle struck his wheel and damaged same. I dismounted and ascertained he was not hurt. New York City's distinctions include the first bikeway, the first police bike patrols, and also the first car-bicycle collision on May 30, 1896. Charles Duryea is credited with introducing the drop-frame on his Sylph bicycles first produced in Chickopee, Mass. After building the first successful automobile in 1893, Charles and Frank Duryea became the first American automakers, producing 13 vehicles in Peoria, Illinois three years later. 1890, Rouse Duryea Cycle Co., of Peoria, is incorporated. Charles contracts in the Springfield, MA area to have his Sylph bicycle built. "Young Johnnie Steele has an Oldsmobile . . ." begins a song that many can hum today. Its refrain, "Come away with me Lucile . . ." was shocking for its inviting suggestiveness in 1905, and the song became a national hit for Morphy, who might have been the first one-name pop star in American music history. Gus Edwards composed the song and Vincent Bryan penned the immortal lyrics. It was published by M. Witmark & Sons on New York's Tin Pan Alley in 1905. 1895 Ransom Eli Olds, a manufacturer of stationary gasoline engines teams up with Frank Clark, the son of a carriage maker, to build a self-contained, gasoline-powered carriage. Your great grandfather's Oldsmobile was born when the Olds Motor Vehicle Company was founded 1897. It became a division of General Motors in 1908 and has 2,801 dealerships across the U.S.
May 8, 1905 Oldsmobile sponsors the first trans-continental automobile race from New York City to Portland, Oregon, matching a pair of new Curved Dash models. Dwight Huss and Milford Wigle arrive 45 days later. December 12, 2000 General Motors announces it will discontinue the Oldsmobile line. Massive advertising and quality products could not shake the brand's stodgy image of "Your father's Oldsmobile," so America's first and oldest automaker will join the "boneshaker" and the "ordinary" in transportation museums. The last Oldsmobile to carry the brand will be the 2002 Bravada Sport Utility Vehicle. 1902 Reality was as far from romanticism at the turn of the century as it is today. When roads dried out they became lines of rock-hard ruts that were as difficult for early cars like this Curved Dash Oldsmobile as they were for bicycles. 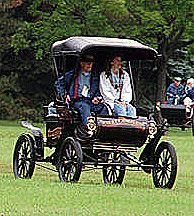 1997 A Curved Dash Oldsmobile, produced in 1901, drives into a Lansing, Mich., park in 1997 as part of the automaker`s 100th anniversary. 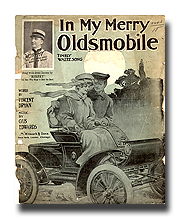 The Curved Dash built from 1900 to 1904 was the first car to carry the name Oldsmobile. With a 66-inch wheel-base it weighed about 650 pounds. It was powered by a one-cylinder, seven-horsepower engine and cost $650. It was the first car built using a progressive assembly system. The company produced 425 vehicles in 1901, 2,500 in 1902, 4,000 in 1903 and 5,508 in 1904. For a time the Curved Dash Runabout was the best-selling model in the United States. 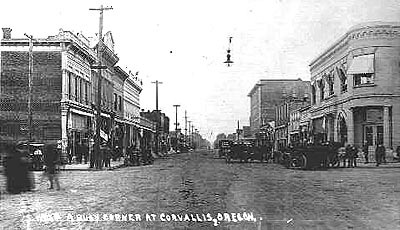 July 4, 1904 Corvallis got its first car when Mark Rickard, the first person to own an automobile in Benton County, drove into town in a shining, 2-cylinder REO touring car that cost $1,450. It had a painted wooden body, varnished wood fenders, a wicker trunk and leather upholstery, but no top -- that and the windshield cost extra. The starting crank was positioned on the side of the car, so, in the event it started forward more quickly than intended, no one would be run over. According to Rickard, the car traveled about 20 miles an hour, and got 10 miles to the gallon. Car owners often purchased their gasoline at drug stores. Usually in pints or quarts, and never more than a gallon at a time. The REO was built by Ransom Eli Olds who resigned from his own Olds Motor Co. in 1904 after disagreements with financial backers. His REO Motor Car Company outsold Oldsmobile in 1905 and 1906 and continued building cars until 1936 and trucks until 1975. One of his most successful models was the stepvan used by police and deliverymen and immortalized in silent films, the REO Speedwagon. 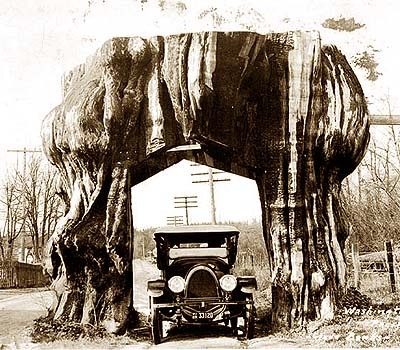 The giant red western cedar of Snohomish County, Washington measured 25 feet in diameter and was estimated to be 1,250 years old. Cover of a linen finish, Curt Teich folder postcard, published by Lipschutz & Katz in Portland, Oregon. This card was mailed in July, 1935. One collector has 17 different views of this tree online.